Since 1982, the Hudson River National Estuarine Research Reserve has played a key role in monitoring and preserving tidal wetland sites in the Hudson River Estuary. Now celebrating its 35th year, the Reserve is committed to protecting the region for future generations to enjoy. The Hudson River National Estuarine Research Reserve is operated as a partnership between the NY State Department of Environmental Conservation (DEC) and the National Oceanic and Atmospheric Administration (NOAA). This region was designated a part of the National Estuarine Research Reserve System in 1982, which is a vast network of 29 protected U.S. coastal areas that focuses on research, preservation, and environmental education of estuaries. The Hudson River Reserve encompasses about 5,000 acres of tidal wetlands across four sites: Stockport Flats in Columbia County, Tivoli Bays in Dutchess County, and Piermont Marsh and Iona Island in Rockland County. These sites were selected as field laboratories because of their diverse plant and animal communities. The Reserve’s headquarters is at the Norrie Point Environmental Center in Staatsburg, NY, where the DEC conducts estuarine-management research, provides training and education, and hosts public events and workshops. 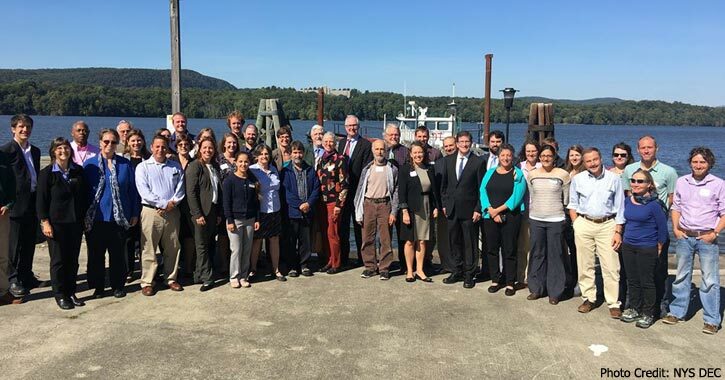 In October 2017, the DEC, the NOAA, and other officials, scientists, and more joined together to celebrate the Hudson River Reserve’s 35th anniversary. During the celebration, DEC and NOAA officials also dedicated the new Turkey Point Tide Station, which was established to monitor tides and transmit highly accurate water level data. This new station will provide essential tide information as it is just the second permanent tide station in the Hudson River Estuary. Over the years, the station will help increase the accuracy of tide predictions and assist with the Reserve’s management of the region. For the next 35 years and beyond, the Hudson River National Estuarine Research Reserve aims to build on their progress and continue to support this important ecosystem.